2017 Toyota Tundra 4WD SR5 - CARFAX Certified 1 Owner - No Accidents - Fully Serviced - Quality Certified W/up to 10 Years, 100,000 miles Warranty. This Toyota includes: SR5 RUNNING BOARDS SR5 UPGRADE PACKAGE Engine Immobilizer Auto-Dimming Rearview Mirror Universal Garage Door Opener Security System Adjustable Steering Wheel Power Driver Seat Driver Adjustable Lumbar Bucket Seats GRAPHITE, FABRIC SEAT Cloth Seats RADIO: ENTUNE AM/FM/HD W/CD PLAYER Smart Device Integration HD Radio Navigation System CD Player Back-Up Camera AM/FM Stereo Satellite Radio Bluetooth Connection Auxiliary Audio Input MP3 Player SR5 PACKAGE BLACK *Note - For third party subscriptions or services, please contact the dealer for more information. * Why does this vehicle look so great? The CARFAX report shows it's only been owned by one owner. This 4WD-equipped vehicle handles any condition on- or off-road with the sure footedness of a mountain goat. With unequaled traction and stability, you'll drive with confidence in any weather with this Black 2017 4WD Toyota Tundra 4WD SR5 - CARFAX Certified 1 Owner - No Accidents - Fully Serviced - Quality Certified W/up to 10 Years, 100,000 miles Warranty. Get a complete and detailed history at no charge on this wonderfully maintained pre-owned vehicle. This Toyota Tundra 4WD is beautiful and the interior is clean with virtually no flaws. Feel pleased in your decision to buy this Toyota Tundra 4WD as it's still covered under the manufacturer's warranty. High performance is what this vehicle is all about. You will be reminded of that every time you drive it. Buying a pre-owned vehicle shouldn't mean buying a vehicle with scratches, blemishes, and paint touch-ups. Fortunately, the paint on this 2017 Toyota Tundra 4WD SR5 - CARFAX Certified 1 Owner - No Accidents - Fully Serviced - Quality Certified W/up to 10 Years, 100,000 miles Warranty is as flawless as a new vehicle. This extraordinary find is a once-in-a-lifetime opportunity for someone who understands automotive magic. No Credit / Bad Credit / No Paystubs, No problem !! ! All Approved ! Everyone drives ! CLEAN, GORGEOUS, LOW MILES, SHOWROOM CONDITION. CALL NOW QUALITY CERTIFIED up to 10 YEARS 100,000 MILE WARRANTY , To Certify a vehicle, there will be an additional cost for Certification. CALL NOW For details. STUNNING AGGRESSIVE LOOK ON THIS BEAUTIFUL--Call today to schedule a test drive... Good Credit/Bad Credit/No problem!!!! Get paid cash? No problem!! 100% Credit Approval with interest rates starting at 2.49% for qualified customers, our rates will not be beaten. We price our cars at wholesale price to guarantee the best deals for our customers. Our inventory moves quick, please call to confirm the availability of the vehicle of your interest Springfield location 973-564-0112. This vehicle is located at our SPRINGFIELD location. Come visit our new showroom in Springfield NJ. 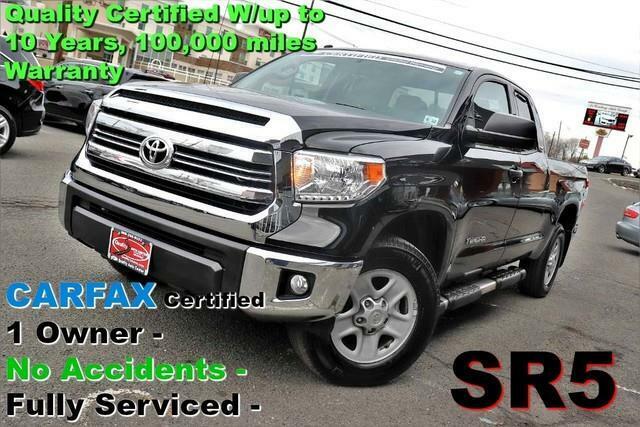 CARFAX Certified 1 Owner - No Accidents - Fully Serviced - Quality Certified W/up to 10 Years, 100,000 miles Warranty 2017 Toyota Tundra 4WD SR5 only has 42,532mi CARFAX shows that this is a one-owner vehicle -- no wonder it's in such great condition. When Toyota created this vehicle with 4 wheel drive, they immediately enhanced the performance ability. Easily switch between two and four wheel drive to take advantage of the improved steering and superior acceleration. This vehicle includes important services and maintenance records, so you can feel more confident about your buying decision. Beautiful exterior. Clean interior. This Toyota Tundra 4WD is so immaculate it is practically new. Well-equipped, well-cared for and still covered under the manufacter's factory warranty. The perfect balance of speed and control has been injected into this 2017ToyotaTundra 4WD. You demand the best in everything, so why would your automobile be any different? Enjoy the best features available in this stunning Toyota Tundra 4WD. This is your chance to own the very rare Toyota Tundra 4WD. No Credit / Bad Credit / No Paystubs, No problem !! ! All Approved ! Everyone drives ! CLEAN, GORGEOUS, LOW MILES, SHOWROOM CONDITION. CALL NOW QUALITY CERTIFIED up to 10 YEARS 100,000 MILE WARRANTY , To Certify a vehicle, there will be an additional cost for Certification. CALL NOW For details. STUNNING AGGRESSIVE LOOK ON THIS BEAUTIFUL--Call today to schedule a test drive... Good Credit/Bad Credit/No problem!!!! Get paid cash? No problem!! 100% Credit Approval with interest rates starting at 2.49% for qualified customers, our rates will not be beaten. We price our cars at wholesale price to guarantee the best deals for our customers. Our inventory moves quick, please call to confirm the availability of the vehicle of your interest Springfield location 973-564-0112. This vehicle is located at our SPRINGFIELD location. Come visit our new showroom in Springfield NJ. This outstanding example of a 2017 Toyota Tundra 4WD SR is offered by Quality Auto Center. With 4WD, you can take this 2017 Toyota Tundra 4WD to places roads don't go. It's all about the adventure and getting the most enjoyment out of your new ride. You could keep looking, but why? You've found the perfect vehicle right here. You can finally stop searching... You've found the one you've been looking for. Beautiful color combination with Black exterior over Gray interior making this the one to own! No Credit / Bad Credit / No Paystubs, No problem !! ! All Approved ! Everyone drives ! CLEAN, GORGEOUS, LOW MILES, SHOWROOM CONDITION. CALL NOW QUALITY CERTIFIED up to 10 YEARS 100,000 MILE WARRANTY , To Certify a vehicle, there will be an additional cost for Certification. CALL NOW For details. STUNNING AGGRESSIVE LOOK ON THIS BEAUTIFUL--Call today to schedule a test drive... Good Credit/Bad Credit/No problem!!!! Get paid cash? No problem!! 100% Credit Approval with interest rates starting at 2.49% for qualified customers, our rates will not be beaten. We price our cars at wholesale price to guarantee the best deals for our customers. Our inventory moves quick, please call to confirm the availability of the vehicle of your interest Springfield location 973-564-0112. This vehicle is located at our SPRINGFIELD location. Come visit our new showroom in Springfield NJ.